But I’d put it differently. I’d say that the Fed’s policy is to do nothing about unemployment because Ron Paul is now the chairman of the House subcommittee on monetary policy." UPDATE X: Another told ya so (originally posted in April 2009). "While data zealots have declared the end of the Great Recession, its pain is still very real for millions of Americans." Read The New York Times, We Haven’t Hit Bottom Yet. UPDATE IX: In the future, will this time be known as 'The Great Unemployment?' Read The Atlantic, How a New Jobless Era Will Transform America. UPDATE VIII: "Those in the lower-income groups are in a much, much deeper hole than the general commentary on the recession would lead people to believe." Read The New York Times, The Worst of the Pain. And who dug the hole, Bush or Obama? UPDATE VI: The unemployment rate jumped to 10.2 percent in October, the highest since 1983. Read The New York Times, U.S. Unemployment Rate Hits 10.2%, Highest in 26 Years. But "the truer measure of unemployment -- a total count of everyone who should be working full time but is not -- hit 17.5 percent in October, the highest level in modern times." But thank God we saved Government Sachs. UPDATE IV: Pity the non-government worker, unemployment is still bad, bad, bad. Read The New York Times, A Scary Reality. UPDATE III: If Obama don't watch out, the unemployed fat lady might crush his presidency. Read the Washington Post, Shaky Economy May Dislodge Obama's Footing. UPDATE II: How come the fat lady still ain't got a job? Cause there ain't none to be had, unemployment rose last month to 9.5%, and that number is probably an understatement. 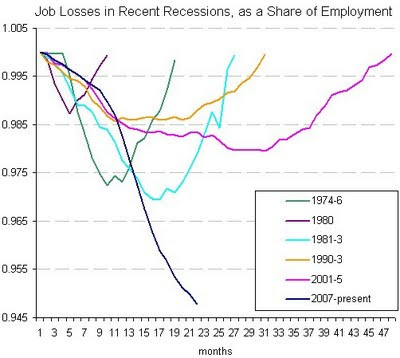 Read the Washington Post, Job Losses Dampen Hopes for Recovery. Obama shouldn't have given all the money to the robber banks. UPDATE: The fat lady still ain't got a job, and her prospects ain't good. Read The New York Times, G.M.’s Latest Plan Envisions a Much Smaller Automaker and Workers Walk the Plank. The later article notes that "[w]hile Wall Street is breaking out the Champagne, the rest of the economy is beyond terrible, and will be for the foreseeable future." You can thank those Republi-cons and their war on the middle class. Are happy days here again? Is the economic mess behind us? There is an old saying, it ain't over 'til the fat lady sings, which means that one shouldn't assume the outcome of some event until it has actually finished. Read The New York Times, As Stocks Surge, Fears Linger About the Economy. After the looting and robbery of the treasury of trillions of dollars, the government has succeeded in propping up the stock market. But the stock market decline wasn't the problem, it was just a symptom. The real event was an economic downturn, which was caused by massive fraud on Wall Street that was facilitated by deregulation and lack of government oversight, all part of a larger Republi-con decades-long war on the middle class, but that is a subject for another post. Bottomline, the trillions were a mere band aid to hide the gaping wounds of the economic downturn. And my bet is, it ain't over.